Shh, don't tell anyone but we've ducked out for lunch. 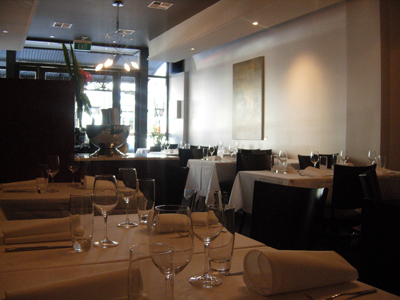 Two options are available - limited choice a la carte (2 courses/$30 3 courses/$40 with a glass of Punt Road Wine) and a five course tasting menu. Just to be different we've opted for the a la carte option. 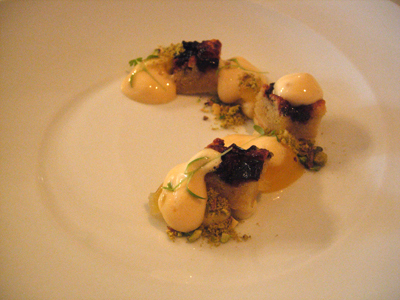 A dish where its presentation equals its taste. The cinnamon smoke doesn't flavour the beef, it rather just perfumes the air. 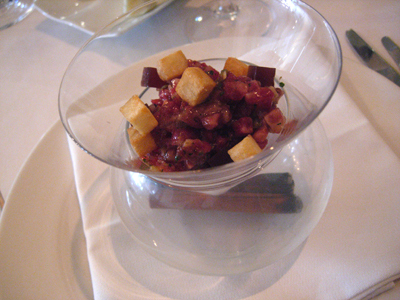 The cubes in the tartare are fried potato and a savoury jelly. 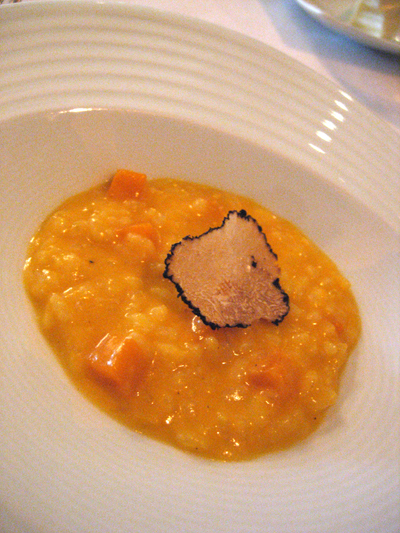 Pumpkin Risotto with Perigord Truffle - even without the truffle this would be a perfect risotto. Creamy rice and sweet pumpkin this is extremely moorish. 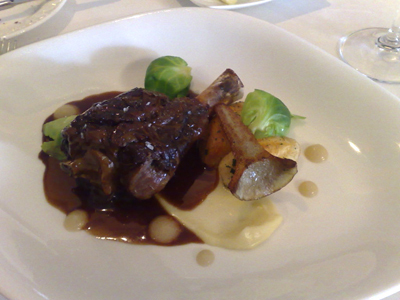 Paalo has the slow cooked lamb shank, roasted potato, brussels sprout leaves, celeriac puree. The meat just dropped off the bone, lusciously tender and full of flavour that only time can bring out. 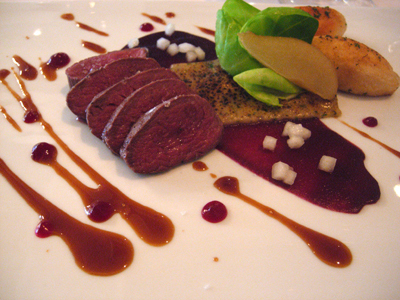 I have the Venison loin, red cabbage puree, roasted pear and potato. The red cabbage puree is an eye-opener especially with it's underlying vinegary tang. 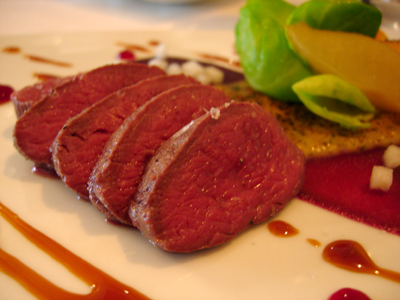 The venison certainly deserves a close up - you really couldn't prepare it any better than this. Rye bread tuille, pear sorbet and cinnamon meringue - this has all the flavours of a pear crumble and brings all those elements of comfort you would associate with this combination of flavours. 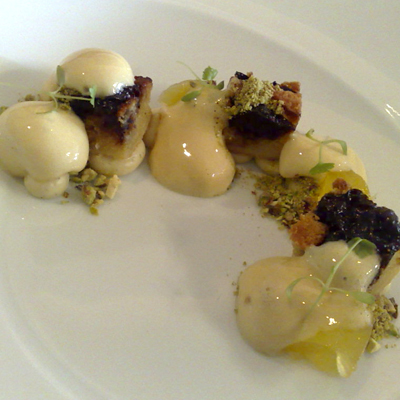 We both ordered the same dessert which was the broken plum friand with pistachio, jelly and creme anglaise. 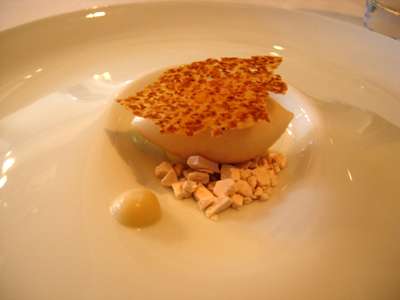 Once again, it is another stunning dessert from Pierre. 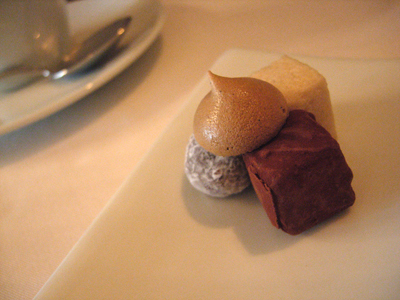 Seriously we must come here for the dessert degustation! If you're looking to kill a few hours over a superb meal then head over to Interlude, you won't be disappointed.